It was lunchtime and I was hungry. I was ripping down the groomed run towards the Northstar mid mountain lodge - thinking about something Mexican from Chili Pepper's. Maybe a burrito or something smothered in cheese. That's when I saw it - a monkey in the woods. 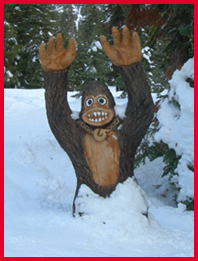 Well, not a real monkey, but a wooden monkey winking devilishly at me. Well, now exactly winking, but looking at me weirdly from his post against the tree. I stopped, pondering the monkey. It was then that I noticed the split log - a natural rail slide. And the limbed Spruce, bent into a rainbow rail. I meandered down the trail, in and out of trees, just as a couple of riders came by. They hit the logs, attempted a hit of a tree, and then careened out of site over a mini log cabin. Pretty cool stuff. This mini world of pseudo natural hits and rails was designed in conjunction with Jake Burton, Burton team riders and Snow Park Technologies (SPT). It combines park riding with a big mountain feel to help skiers and riders develop their all-mountain skills in a fun, natural environment. Freestyle features in the The Stash are constructed of wood logs and other natural materials. Wood signage carved with chainsaws begs to be jibbed and huge logs provide natural rails slides. 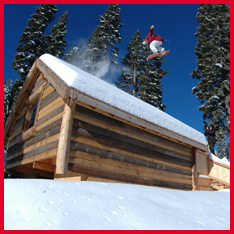 The log cabin, CK Cabin, is dedicated to the memory of legendary snowboarder, Craig Kelly. It gives riders ample opportunity to jib, jump over or hang out inside. "I've always been inspired by riders like Craig Kelly and Johan Olofsson who are so fluid and creative with big mountain runs, throwing in freestyle moves and hitting different natural features on the way down," says Jake Burton, Founder and Chairman of Burton Snowboards. "That's what The Stash is all about - going top-to-bottom with your friends, connecting hits and getting creative on organic features like trees, stumps, gaps and banks." Burton's concept for The Stash came to life with help from Snow Park Technologies and the Northstar Resort terrain park crew. The Stash is designed to feel like a favorite, misty tree run punctuated by natural jibs, gaps, pillow lines and transitions. Both intermediate and advanced riders can get creative and enjoy discovering new goods in every run. Artist Bob King used chainsaws to carve jibbable wood signs that lead riders to The Stash. "The Stash is simply that dream we all have of just cruisin' and hittin' all the dopest crap in one run - ill pow hits, logs and banks," says Burton Global Team rider Jeremy Jones. "No more dreamin' baby. Northstar's Stash is for real." Chris 'Gunny' Gunnarson, Director of Youth Market Development for Booth Creek Resorts, is also stoked about The Stash. "It's not quite a park. And it's not exactly like riding the backcountry. It's somewhere in between both. I never thought I would get this excited about a run at a resort. What a project this has been. Working with Jake and the Burton team has been a ton of fun and a special experience. The Stash should be on your must-ride list this year." Burton selected Northstar-at-Tahoe Resort as its first North American resort partner for The Stash because of the resort's ongoing commitment to the progression of the sport. 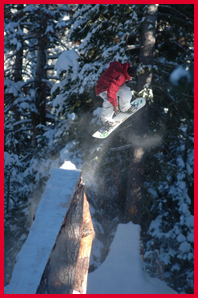 In addition to The Stash, Northstar Resort has four other terrain parks begging for discovery. For more on The Stash see TheStash.com.